Mugendi is a Kenyan farmer. Married with two children, he lives in a small village in Tharaka Nithi County. Over the years, he has experienced challenging changes to the climate in his region. Share the story Mugendi, a farmer in Kenya who has learned new ways to adapt to climatic changes. Recurring dry spells and failed rainy seasons were killing off the crops. 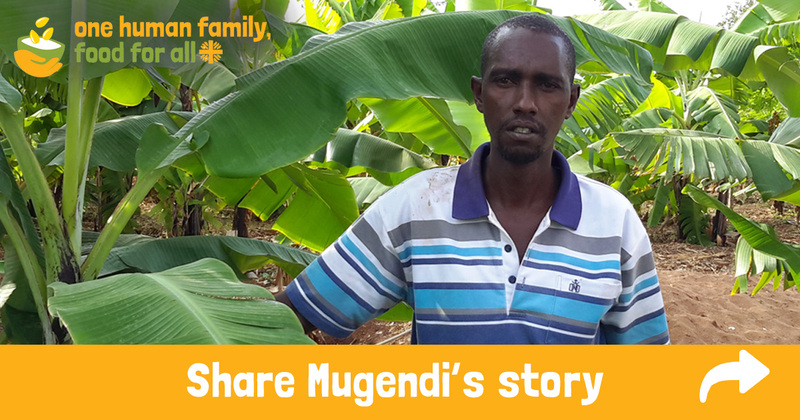 Mugendi was forced to abandon his land and seek employment elsewhere. He found work as a hotel supervisor, but it was very poorly paid. In 2013 however, Mugendi was able to start the journey back to his land when he joined Caritas Meru’s Arid and Semi-Arid Lands Resilience Programme. The programme helps the community to improve food supply by adapting to the changing climate. Together, the community established an irrigation scheme which connected five hundred households in the community, including Mugendi’s. This gave the family access to much needed water. The farmers in the programme also learn techniques to adapt to their changing climate, such as the use of drought-tolerant seeds and water-sensitive planting techniques, and planting a variety of crops. Armed with new knowledge and skills, Mugendi has been able to return to his land and make effective changes to his farming practices. Today his land provides him with a source of income so that he can provide for his children. “I can now take my child to private boarding school,” he says. His farming has also improved his social standing in the community. “Siku hizi wananiita Gavana,” says Mugendi. “These days my neighbours refer to me as Governor” — a sign of respect.